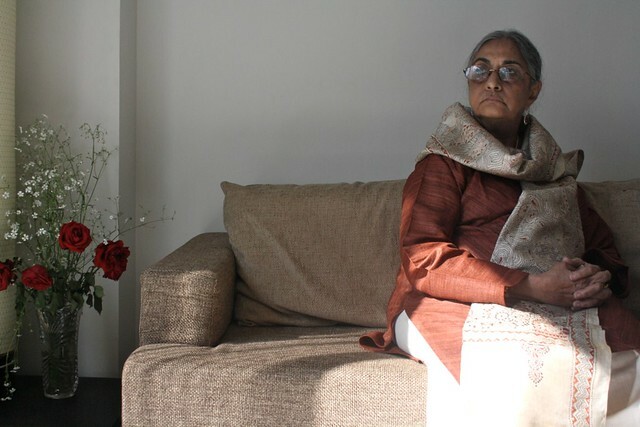 Gazing at her husband’s photograph, she says, “He taught me a lot.” A pause follows after which 80-something Sakina Mehta continues in her soft voice, “He gave me the courage to go out into the world.” Tyeb, Mrs Mehta’s husband, was one of India’s most celebrated modernist painters. In 2009, he died of a heart attack. Since then Mrs Mehta has been dividing her time between Bombay, where her son lives, and Delhi, the home of her daughter. 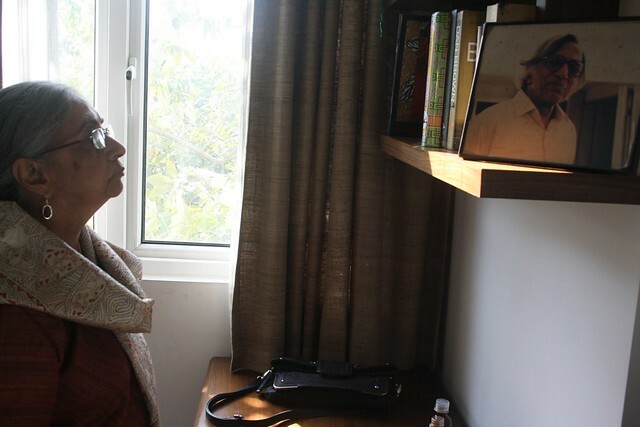 The Delhi Walla meets her at her daughter’s second floor apartment in Greater Kailash-II. Thanks to a wall-sized glass window, the living room is filled with the clear light of the sunny afternoon. Mrs Mehta is in maroon kurta, cream shalwar and an embroidered dupatta. 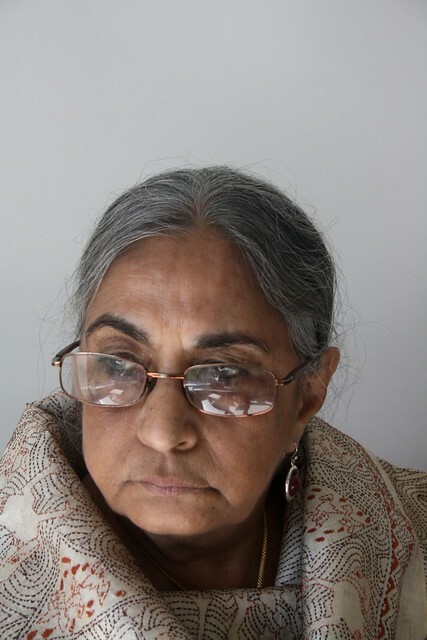 A Bohra Muslim from Bombay, her bonds with Delhi are old. In 1965, after a five-year stint in London, Mrs Mehta and her husband moved here with their two children. He was a struggling artist. It would be after 32 years – at his Lokhandwala apartment in Bombay – when he would paint Mahisasura, the work that was sold at Christie’s in New York for $1.58 million, the highest price ever paid for a living Indian artist. One reason why the Mehtas chose Delhi over Bombay on their return to India was because they could not afford to live in their home city. 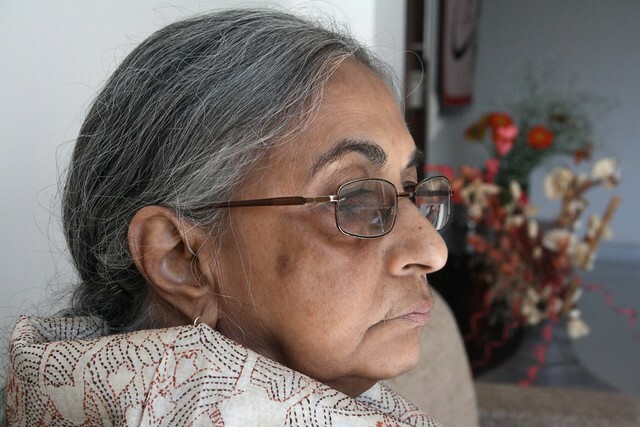 “We did not want to stay with our joint family in Bombay and we had no money to buy a flat there,” Mrs Mehta says, talking slowly as she recalls the past. “Hussain suggested us to come to Delhi since the barsatis (terrace houses) here were cheap to rent.” She is referring to the iconic painter MF Hussain, her husband’s contemporary, who was living in Jangpura, south Delhi, at the time. The Mehtas’s new home was in Nizamuddin East, a neighborhood of bungalows, apartments, servant quarters, ruins and trees. The house consisted of one room. The bathroom was under a staircase. The kitchen was in the courtyard. It had a tin roof. The passage that connected the entrance door to the room was where Mrs Mehta’s husband painted. Being the family’s breadwinner, she had to find a job. This was a remarkable transformation for a woman who grew up in a conservative Muslim family of Bombay and who studied only till high school. When Mrs Mehta was 16 and her parents announced that some people were coming to finalize her engagement, she knew that the boy would be one of the three sons of her paternal uncle. Her only question to her father was: “Which of the three brothers I’m getting married to?” It could have been Nooruddin or Zoeb, but it was the eldest, Tyeb, a diploma student at the J.J. School of Art. During the five years of engagement, Mrs Mehta – chaperoned by her younger sister – dated with her fiancée in Shivaji Park and Marine Drive. They watched films at Arora cinema in Matunga. At his school, Tyeb introduced her to his fellow artists SH Raza, Vasudeo S. Gaitonde and Akbar Padamsee. “Initially when he talked about painting and how he intended to paint,” Mrs Mehta says while holding a cup of Earl Grey, “it would all go over my head. Slowly, I started understanding about art. I listened, and didn’t resist anything.” The marriage happened in 1951. The son, Yusuf, was born three years later. The daughter, Himani, arrived in 1961. The week Mrs Mehta’s husband managed to sell a painting, the family would celebrate the event by dining out: either at Moti Mahal, a Mughlai restaurant in Daryaganj, or at Aka Saka, a Chinese eatery in Defence Colony. On weekends, they picnicked in monuments where they ate and read. Some mornings, painter Hussain would come to pick the Mehtas in his fiat car, which he had painted himself, and drove them to Karim’s in Old Delhi for a traditional Muslim breakfast of nihari. Every night the Mehtas hosted an open house where friends argued art over meat curry and rumali rotis. The family had its base in Delhi for 14 years before moving back to Bombay. “In Delhi, we continually struggled as far as money was concerned.” The life became comfortable, financially, during the nineties. Mahisasura was sold in 2005. It was the first time a piece of contemporary Indian art had crossed the million-dollar mark, though the money went to the seller who had bought it at a lesser price from the painter. The following year, another Tyeb sold for $2 million. Yet, the woman has adapted beautifully to this new Delhi. She meet friends in India International Center, attend classical music concerts in Nehru Park, buy gifts in Dilli Haat, and shop for salwar suits in Select Citywalk mall. At the Big Chill restaurant in Khan Market, she treats herself to smoked chicken salad. 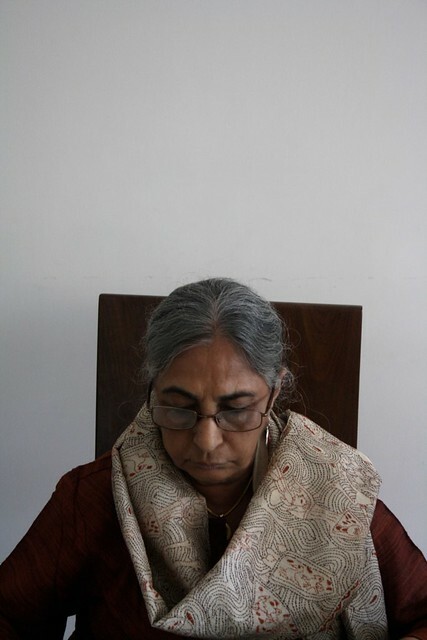 Her art tours have expanded from Triveni Kala Sangam to the National Gallery of Modern Arts. In February 2011, she was spotted at Vadhera Art Gallery, Defence Colony, which was holding an exhibition of her husband’s works, the first after his death. Thank you, Mayank, for introducing me to an artist of Tyeb Mehta’s stature through your portrait of a brave woman.